Sicily is known for many things: hot weather, tanned men, the Mafia, but let’s honest, the real reason people (me) go there is for the food, right?. 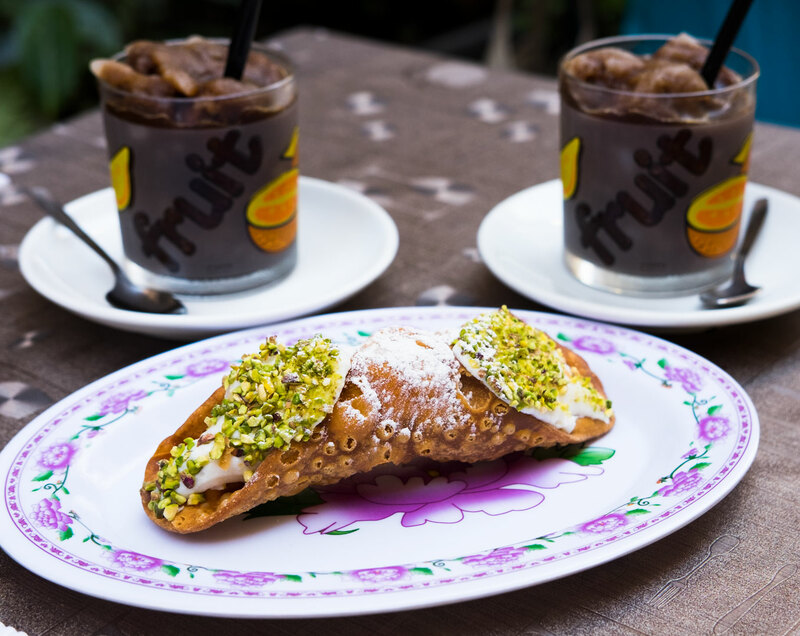 Before I even touched down in Catania, I had planned my eating schedule, in a truly selfless act so that I could write this here article about the four things you need to eat in Sicily. My pants may be tighter for it, but I am one happy little piggy who is still dreaming about the daily sweet treats. As a mezzo Italiano it’s legally required of me to passionate about Italian food. I’m pretty sure they take your passport away if you claim any other country can cook a pasta half as well. But, despite my family being from the other end of the boot (Veneto) pretty much all of my favourite dishes come from Sicily. Mangia, mangia! So how could I possibly narrow it down to only four things you need to eat in Sicily, you ask? With great difficulty. But because I’m a truly dedicated journalist devoted to uncovering the truth, I powered through. And here are my findings. Had a granita for breakfast? 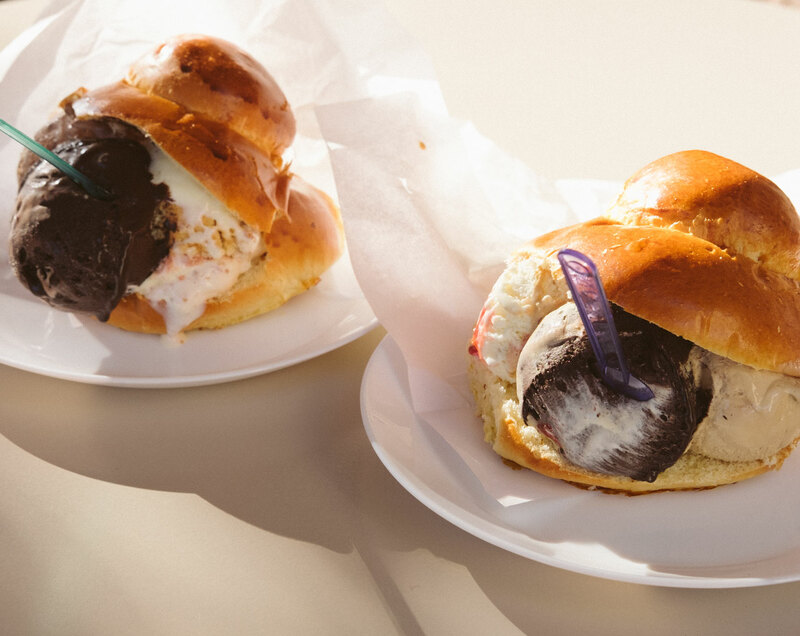 Now you can back it up with a mid-morning brioche con gelato, which is, to be honest is just an ice cream sandwich, except better because, Italian. And yeah, I know you’ve all had brioche before, but it’s what they do with it. What characterises the Sicilian brioche is the “tuppo” – the little topper or knobby thinga-ma-jig on the bun. Anyway, there’s not much more to say here except you go to a cafe, they stuff it with three(!!!) scoops of gelato, you eat, fall into a sugar coma and wake in a puddle of your own gelato drool. And you do it all again the next day. It should be said at this point that I have never been a sweet tooth, but in Sicily I turned into a full-time sugar junkie. It’s basically a fast track to diabetes if you were ever in the market. If you go to Sicily and don’t have Granita, did you even go to Sicily? NO YOU DID NOT. If by some chance you ignored every sign, every tourist toting a glass cup and every single bone in your body and missed having granita, turn around, get back on a plane and get some into you. Just to be clear: Sicily is the birthplace of granita. The mothership. Yes you can get it elsewhere in Italia but doesn’t everything taste better when it’s made from Mum? Before I went to Sicily I tried to look up what granita was and to be honest , it didn’t stoke my fires at all. Wiki describes it as “a semi-frozen dessert made from sugar, water and various flavourings.” And I thought, but why bother when you already have gelato? Because it’s freakin delicious is why. Essentially it’s like an OG slushie, but creamier, with finer ice and real flavourings like pistachio, lemon, coffee or ricotta (“blue” is not a colour of food in Italy). Also, it’s acceptable at breakfast, snack time, lunch, dinner, midnight, four or eight times a day because in Italia there’s no judging when it comes to eating (just coffee… don’t ever drink a cappuccino past midday you brute). When I was a kid, my nonna once made cannoli. I didn’t know what it was at the time but it was like crack, and I asked for it every time she baked after that. That’s the cannoli effect. In fact, when I watched The Godfather for the first time and that famous line was uttered “leave the gun – don’t forget the cannoli” it spoke to my soul. So, to be in the land of cannoli was like arriving at the pearly gates of gastronomic heaven. For those who don’t know, first of all, how have you been living? And secondly, let me blow your mind. Cannolo takes a crispy, fried pastry shell that’s folded into a little blanket, and houses the most delicious creamy filling. So every bite is a mix of crunch and goo, and is a blatant taste sensation. Wow, I just re-read that sentence. Someone make me a food critic already. Anyway, don’t be the schmuck who buys the pre-filled ones. Be the cool guy who goes into the pasticceria, sees the empty shells and says “uno cannoli con ricotta per favore”. Because, yes there are other flavours but if you first don’t try the sweet ricotta original you are doing your stomach a great disservice. Two strange things about this post: 1) I wrote about three sweet things before I wrote about savoury which I feel makes me a traitor to my salty kind, and also perhaps more disturbingly is the fact that it took me 600 words to tell you about my death row meal: arancini balls. One of my lesser known skills is being able to spot these from across a sea of canapes and magically get to them before they disappear. I have been known to use elbow force where necessary. And I have no regrets. Anyway, because Sicily is brilliant they invented them. Essentially risotto, flavoured with goodness (anything from meat to eggplant) and stuffed with gooey cheese in the centre. Then crumbed and deep fried because, why the hell not? Carb on carb with cheese. I’m so proud to be an Italian and come from a land that honours carbs in the way they deserve. The only difference with the ones from the motherland is that they’re big. No pissy bite-sized balls here. They are literally more than a fistful, and are a meal in themselves so don’t be fooled into thinking they’re a snack. Even a seasoned arancini scoffer like me could only get through two, max. And I needed a nap afterwards (fortunately this is also encouraged in Italy so WIN!). And this dear friends, is the complete list of the four things you need to eat in Sicily. I may be kilos heavier and made almost entirely of sugar and carbs now, but my god was it worth it.